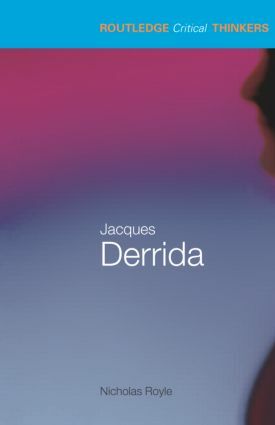 There are few figures more important in literary and critical theory than Jacques Derrida. Whether lauded or condemned, his writing has had far-reaching ramifications, and his work on deconstruction cannot be ignored. This volume introduces students of literature and cultural studies to Derrida's enormously influential texts, covering such topics as: deconstruction, text and difference; literature and freedom; law, justice and the 'democracy to come'; drugs, secrets and gifts. Nicholas Royle's unique book, written in an innovative and original style, is an outstanding introduction to the methods and significance of Jacques Derrida. Nicholas Royle is Professor of English and American Studies at the University of Sussex. He is Joint Editor of the Oxford Literary Review and author of several influential texts. His recent publications include Deconstructions: A User's Guide and The Uncanny: An Introduction. Routledge Critical Thinkers is designed for students who need an accessible introduction to the key figures in contemporary critical thought. The books provide crucial orientation for further study and equip readers to engage with theorists' original texts. what to read next and why. Featuring extensively annotated guides to further reading, Routledge Critical Thinkers is the first point of reference for any student wishing to investigate the work of a specific theorist.